Male / Female; Graduate of any business course; With experience in Hotel industry; Must be PC proficient; Strong written and communication skills; Ability to follow instruction; Detail-oriented; Physical mobility and stamina required. Female; At least High school graduate; With experience or without experience; With good communication skills; Experience is a plus. Male; With 5 years relevant work experience; At least College level or graduate of technical courses; Understand the different phases and aspect of building construction such as but not limited to carpentry, plumbing, painting and electrical works; Ability to read / interpret construction diagrams and plans. With relevant work experience; At least high school graduate. Male; With 1 year relevant work experience; Can climb trees. At least high school graduate; Agile; Can swim; Can endure 8 hours of work under the sun. Male; With relevant work experience; At least high school graduate. Male / Female; At least 5’4” in height for Female and 5”5” in height for Male; College graduate preferably any Business course related; With good communication skills (written and verbal) and can perform multi-tasking; With pleasing personality; With good moral character and trustworthy; Can work under pressure with minimal supervision; With experience as Front Office Associate / Receptionist is an advantage. Male; At least 5”7” – 6’0” in height; At least College level; Has a valid Driver’s License; With good communication skills is an advantage; Can work under pressure with minimal supervision; With pleasing personality, flexible; With good moral character and trustworthy; With related experience is an advantage. Male / Female; Graduate of BS Accountancy or BSBA major in Financial Management; With good moral character; With experience in similar nature of job is an advantage. Male / Female; At least 5’4” in height; Graduate of any 4 year Business related course; Pleasing personality; With good moral character; Trustworthy; With experience in similar nature of job is an advantage. Male/ Female; College level of BS Criminology; With Security License; With at least 2 years related experience as Security personnel; With driving skills is an advantage; Good moral character and trustworthy. Female; With pleasing personality; At least 5’4” in height; College graduate of any 4 years course preferably any Business course related; With good moral character and trustworthy; With experience in similar nature of job is an advantage. Female; High school graduate / College graduate; At least 1 year experience in any related field; Thorough understanding of operating cleaning equipment; Has knowledge in cleaning and sanitation products, techniques and method; High level of accuracy and attention to details; Excellent customer service skills; Good interpersonal relation skills; With high energy level and good physical stamina. Male / Female; Candidate must possess a Bachelor’s/ College Degree in Computer Science/ Information Technology/ Computer Engineering or equivalent; Preferably with at least 1 year experience; Must be knowledgeable in PC and LAN troubleshooting or networking; With knowledge and experience in Web Developing (writing HTML, XHTML, XML, Java Script, Visual Basic and CSS); Has excellent skills in Adobe Photoshop; With good communication skills; Must be flexible and capable of handling multiple tasks; Can work under pressure and with less supervision. Female; Single; AB / Graduate of BS in Hotel & Restaurant Management/ Tourism or any related course; At least 5’5”/ 167 cm in height; With pleasing personality; Preferably with at least 1 year of relevant work experience; Fresh graduates are welcome to apply; Has good communication, selling/marketing and people skills; Must be flexible and customer service-oriented; Capable of handling multiple tasks. Female; Single; With pleasing personality; AB/BS in Hotel & Restaurant Management / Tourism graduate or any related course; At least 5’3”/ 162 cm in height and above; Preferably 1 year experience in related field; Knowledge about menu items, wines, liquors and cocktails; Has food and drink service skills; Knowledgeable of food health and safety; Has good communication, selling/marketing and people skills; Must be flexible and customer service-oriented; Capable of handling multiple tasks. Female; Single / Married; College level/ Vocational courses / Short courses of any related field; With pleasing personality; With thorough knowledge of numerous massage modalities; Must possess a general understanding of body treatments and be willing to train in our spa’s specific massage and body treatment offerings; Has basic computer knowledge to be able to learn the product and service knowledge necessary to effectively provide wellness solutions to meet the needs of our guest; Has excellent communication, listening and customer service skills; Must be flexible, friendly, enthusiastic and a team player, with an outgoing personality; Able to work without direct supervision; Willing to undergo massage therapy training if not holding a license. BS Industrial Technology (BSIT) graduate, major in Mechanical Technology. Licensed Mechanical Engineer; With or without experience. BEED graduate; BSED (Mathematics, Science, English) graduate; LET Passers; At least one(1) year of experience (manpower Pooling). 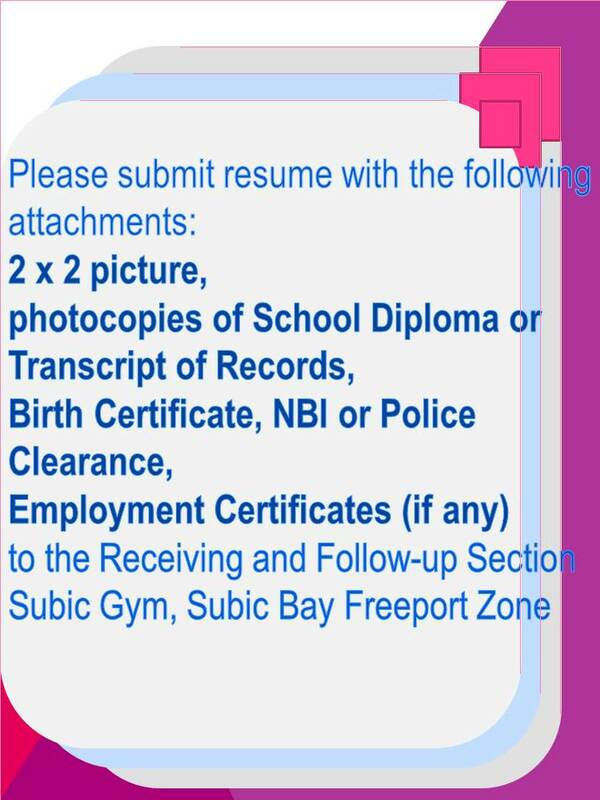 BEED graduate; (major in Special Education); LET Passers; At least one(1) year of experience. BS Nursing graduate; Preferably with Professional Education units or Education graduate; LET Passers; At least one(1) year of experience. Male / Female; At least High school diploma/ Vocational diploma / Short course Certificate in any field; At least three(3) months of experience. Female; College level; With experience. Must be a graduate of BS in Accountancy or any related course; With knowledge in accounting works; Must have strong financial systems background; Must be computer literate; Can be trusted on confidential matters; Self-motivated and result-oriented; Can work under pressure and with minimum supervision; Excellent customer service skills and interpersonal skills; Effective listening skills and multi-tasking skills; Ability to work under pressure and use own initiative; Must be proficient in both oral and written communications. Male; Single / Married; Vocational / College level; Must be knowledgeable of using MIG/TIG Welding machine; Can work overtime on Holidays / shifting schedule. Male; At least 5’5” in height; College level or Vocational graduate; With experience as Production Operator; Can lift 20kls. ; Can work overtime and holidays / shifting schedule.